I had polenta for the first time a few weeks ago and it was pretty awesome. It wasn't regular polenta though, it was some pretty nifty polenta cakes! I've seen them on the Food Network a couple times and I always wondered what they tasted like. It had to be somewhere along the lines of a creamy cornbread, right? Well, my expectations were correct and it was darn tasty. The cakes were really easy to make because the prep work consists of stirring ingredients in a saucepan then pouring it into a baking pan. Easy, right? The hardest part is waiting for it to set up in the fridge because you get so anxious to eat it! After you give the mixture a few hours to chill, you can slice it then cook it up. I tried heating it two ways: grilling it and frying it in a pan with a little oil/butter mixture. The grilled version was okay, but pan-fried version was a little more crisp and the butter gave a really nice flavor that was great with the mild-tasting cakes. As for cutting out the cakes, I did triangles (squares cut in half on the diagonal) but you could get creative and use some cookie cutters to make super cute, kid-friendly sizes. 1. Bring water, milk, and salt to a boil. 2. Whisk in cornmeal, slowly, and stir for a few minutes until it thickens and pulls together. 3. Taste to see if you need more salt. 4. With a spoon, stir in the parmesan cheese and butter. 5. Give another taste to see if it's grainy. If it is, add in about 2-3 TB of water and stir until thickened again. Taste again. If it's still grainy, repeat the process. Keep doing this until it's smooth then turn off the heat. 6. Line a 9x9 pan with plastic wrap or grease it liberally. Pour the polenta mixture into the pan and let it cool slightly to room temperature. 8. When cooled completely, remove the polenta from the pan and cut it into your desired shapes. 9. Coat your grill with oil and cook the polenta on both sides for a few minutes over medium heat or fry in a little oil/butter over medium heat until you get a nice crust. 10. Serve plain or top with Spinach Sauté (recipe follows) and a couple slices of fresh mozzarella cheese. 1. Heat oil in a small pan until hot. 2. Add everything to the pan and cook a few minutes until the spinach and tomatoes are cooked down and the onions are soft. 3. 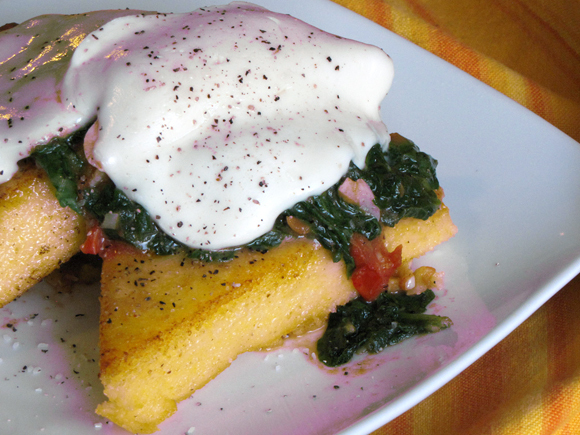 Pour over polenta cakes then top with two slices of fresh mozzarella.